Based on the all-new animated series from DIC! 30 years after The Archie Show made television history as the highest-rated Saturday morning animated series of its time, Archie and his friends are back in animated form! 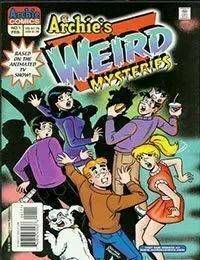 Archies Weird Mysteries combines the classic high school hi-jinx and dating dilemmas Archie fans have grown to love, with creepy mysteries that are equal parts X-Files and Scooby Doo! Of course, we had to spin off a new comic series to go along with the cartoon!